Some oil executives are cautiously optimistic about a Kenney premiership after he promised a more aggressive approach to increasing pipeline capacity. But the industry is still divided over whether to keep some Notley-era plans in place for now, such as an oil-by-rail scheme and a curtailment policy aimed at reducing a supply glut. Alberta politics tends to be dynastic: One party holds majority rule for at least a decade until voters get tired of it and shift allegiance en masse to a party that’s never held government before. That’s what happened in 2015, when Rachel Notley’s New Democrats ended four decades of Progressive Conservative power. 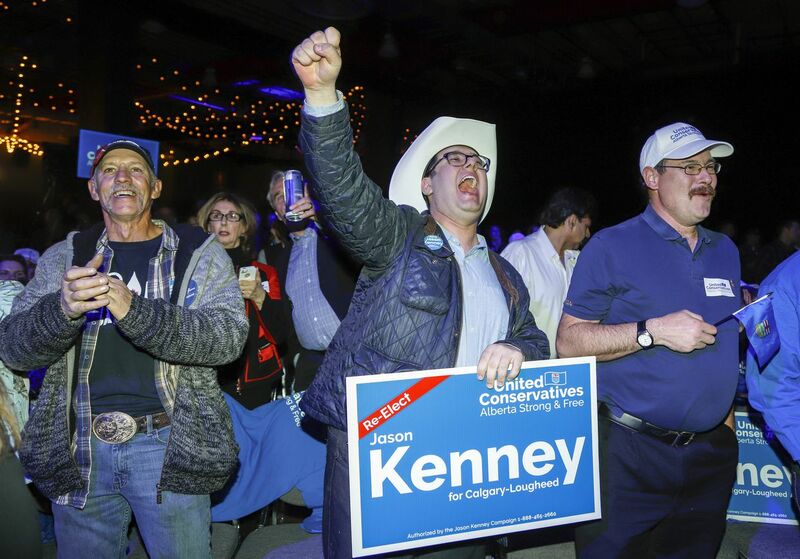 And on Tuesday, it happened again: Jason Kenney’s United Conservative Party – a fusion of the old PC and Wildrose parties that had 25 seats at dissolution – was elected in 63 ridings, or 72 per cent of legislature seats. The UCP also captured more than 55 per cent of the popular vote, more than any winning party has earned since 2001. By Wednesday morning, the electoral map was a sea of UCP blue with islands of NDP orange in Edmonton, Calgary and Lethbridge. The New Democrats went from 60 per cent of legislative seats at dissolution to 28 per cent, and from 40.6 per cent of the popular vote in 2015′s election to 32.2 per cent this time around. The NDP is the first Alberta dynasty to last only one term, and with only one leader. In Red Deer, where the election debate focused on health care, NDP incumbents lost both ridings to UCP challengers: Adriana LaGrange in Red Deer-North and Jason Stephan in Red Deer-South. The ridings straddling Fort McMurray, where some voters shared their apprehensions about a Kenney premiership, were each won by UCP incumbents: Tany Yao in Fort McMurray-Wood Buffalo and Laila Goodridge in Fort McMurray-Lac La Biche. The two ridings in Lethbridge, where a supervised drug-consumption site was a wedge issue between the main parties, were split between NDP incumbent Shannon Phillips in Lethbridge-West and UCP newcomer Nathan Neudorf in Lethbridge-East. After months of political tensions over the Trans Mountain pipeline extension, which his government opposes, NDP Premier John Horgan had a hard time getting enthusiastic about either candidate in Alberta’s election. Whereas Ms. Notley wrote legislation that would let Alberta throttle B.C. 's supplies of oil and gas, but didn’t use it, Mr. Kenney says he would bring those measures into law at his first cabinet meeting and play hardball with the B.C. and federal governments until Trans Mountain is built. Mr. Kenney’s election could soon ignite more legal and trade conflict between the neighbouring provinces.